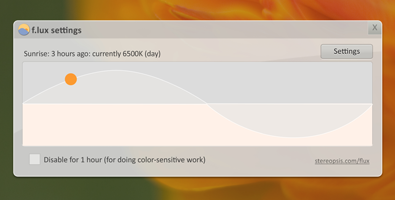 Read more about f.lux for Windows. Define your location using the link within the software's settings. Looks like a great app. Downloaded and installed it. Dont forget to set your location, as iMav has mentioned. You can do it here. Also have a look at SunsetScreen software. Hi iMav I have just downloaded this app too. I will let you know if it works or not. Could be useful as I usually call it a day around 2am GMT. after installing it, all you have to do is to get the coordinate of your country (the program would help you do that) and that's all. It's specially good for those who use their LCDs at night where they do not need too much brightness which might cause eyes strain. Thats a very great app. Thanks for sharing. HappyAndyK : Looks like a great app. Downloaded and installed it.